Snyder's Heating & Cooling is proud to serve the North Lewisburg community! About North Lewisburg, OH - Happy to be your hometown Heating & Air Conditioning Contractor! North Lewisburg is a small village in western Ohio. It is 45 miles north of Columbus and 30 miles north of Springfield. According to the United States Census Bureau, North Lewisburg is populated by approximately 1,478 people as of 2011. North Lewisburg is estimated to be the 3rd largest village in Champaign County. 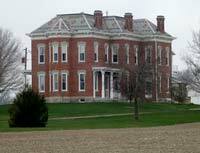 North Lewisburg is in an area of Ohio originally inhabited by Native American Indians. Eventually, individuals of European descent arrived in the area and began establishing homes, farms, and businesses. The Spain family arrived north of modern-day North Lewisburg in 1805. Other families settled in the area and a community quickly developed. In 1826, a man known as Gray Gary platted what is modern-day North Lewisburg. About 18 years later North Lewisburg became an incorporated municipality. Individuals who visit North Lewisburg will discover a charming village. North Lewisburg is home to many community attractions and facilities like a branch of the Champaign County Public Library and the Old Village Alarm and Curfew Bell. The bell was removed from the Old Town Hall building that was constructed in 1870. It bears a crack that is a result of citizens ringing it following the end of World War II. In North Lewisburg, individuals enjoy a quaint community and a charming way of life. It is necessary for residents of North Lewisburg to have cooling and heating systems installed in their homes. The village is in a region of the United States that experiences warm summers and very cool winters. During June, July, and August, the average daytime temperature highs range from the low to mid-80s. In addition to warm temperatures, precipitation is common during the summer months. Professional HVAC technicians recommend residents of North Lewisburg have central air conditioning units installed in their homes. When temperatures rise, the systems are sufficient to cool homes in the village. Professional HVAC technicians also recommend North Lewisburg residents have access to heating units in their homes. During the months of winter, the average daytime temperature highs range from the mid-30s to low-40s. At night, temperatures will drop well below freezing. Also, snowfall is common throughout the winter months in North Lewisburg. Furnaces are sufficient to heat homes in the village. During the long winter months, efficient heating systems may literally be lifesavers to residents of North Lewisburg.